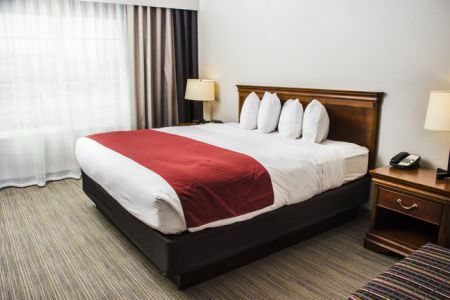 For a quiet stay near I-81 and Shenandoah University, book the Country Inn & Suites® by Radisson, Winchester, VA. Our hotel is a short walk from the Alamo Drafthouse Cinema, where you can enjoy pizza, beer and a movie before coming back to our heated indoor pool. Tour the many wineries in the area or the fascinating Civil War history all around us, including Kernstown Battlefield and Belle Grove Plantation. Take a daytime tour of the Museum of the Shenandoah Valley and unwind at the end of the day in the charming village of Old Town Winchester. Pets are also welcome for a non-refundable fee of $25.00; however, we ask that they not be left unattended in the room. Because pets are only permitted in designated rooms, please be sure to click the pet-friendly option when making your reservation. Need extra sleeping space? 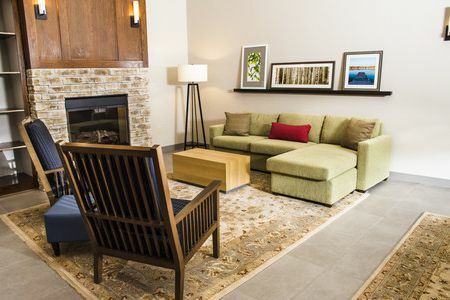 Book a Studio Suite and take advantage of a seating area with a sleeper sofa. Top your Belgian waffle with fresh fruit and pair it with hot coffee to get your morning off to a tasty start. 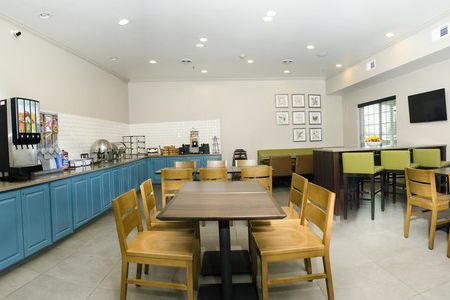 We also offer a rotating selection of hot entrees and a variety of cereals at our free, hot breakfast. For lunch or dinner, head to a nearby restaurant like IJ Canns American Grille, less than two miles away. Alamo Drafthouse Cinema – Take the two-minute walk to the Alamo Drafthouse Cinema for a juicy burger, a fresh salad or a piping hot pizza. Pair your meal with an ice-cold beer and polish it off with a rich dessert, all while watching an action-packed flick. Museum of the Shenandoah Valley (MSV) – Drive north on VA-37 to this museum where the Shenandoah Valley’s history and art are preserved. Surrounded by gorgeous gardens, MSV offers four permanent galleries, including a fascinating gallery of miniatures. Shenandoah University (SU) – Attending a concert, athletic event or graduation ceremony? Our hotel is proud to welcome you for your visit to the Hornet’s Nest. Located less than eight miles south of SU, we offer a convenient home away from home for university guests. Reserve the meeting space at the Country Inn & Suites for your seminar, reception or reunion of up to 45 guests. Enjoy free Internet and easy access to I-81, plus the help of our friendly, knowledgeable staff. Ask about catering recommendations and audiovisual equipment like a screen and a sound system. When the weather is nice, take the celebration outside to our patio.